The Presidency Council moved quickly to send Petroleum Facilities Guards to take over the Sidra and Ras Lanuf oil export terminals from the victorious Benghazi Defence Brigades. The step seems designed to head off any claim on the oil ports by Khalifa Ghwell and his resurrected National Salvation Government. Ghwell along with Sheikh Sadek Ghariani the controversial head of Tripoli’s Dar Al-Ifta has very publicly backed the BDB and its leader Mustafa Sharksi. Idris Bukhamada, appointed by the PC last month as the new PFG commander, arrived in Ras Lanuf today and declared the two terminals under PC and Government of National Accord control. Bukhamada said that his PFG had no political affiliation and no role in any fighting. He insisted “Our mission is only to secure the work of the National Oil Corporation”. He said his men would protect the NOC and its local and international partners to ensure the continuity of oil production and exports. 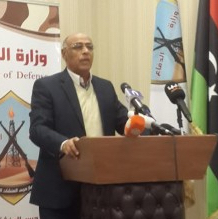 Sharksi had said at his Misrata press conference yesterday that he would not continue his promised advance toward Benghazi until the terminals had been secured. On the face of it, with the arrival of Bukhamada’s PFG, albeit in unknown strength, the BDB is now free to continue its offensive. Bukhamada was originally appointed PFG commander by Ali Zeidan in 2013. But he was ousted in 2014 as part of a deal with rebel PFG commander Ibrahim Jadhran who had seized the four Oil Crescent terminals. Bukhamada is close to GNA defence minister Colonel Mahdi Al-Bargathi, who is reliably reported to have sent an infantry brigade to fight alongside the BDB ar Sidra and Ras Lanuf. Yet when the fighting began on Friday, PC head Faiez Serraj insisted that his government had nothing to do with the attack.